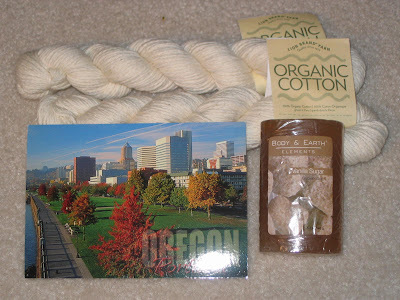 I just received the nicest package from Donna, my angel for the Fall Into Autumn Dishcloth Swap! 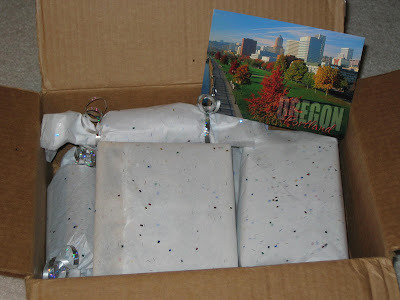 It was special from the moment I opened it... everything was neatly wrapped in glittery tissue and tied with silver ribbon. Each item I opened was so fun, and obviously chosen especially for me. Just look at the yarn!! I'd read about the Lion Brand Organic Cotton and had been wanting to try some, but I couldn't find it around here. If you haven't seen it, it's SO soft... feels like it will be great fun to work with! I can't wait to try it, and have been wondering what I should make with it. The vanilla sugar soap is just right. Mmmmm. WOW, what yummy treats!! I love my coffee, and the nice, bold Sumatra will be great in the morning. (And again in the afternoon with one of the chocolates!!) 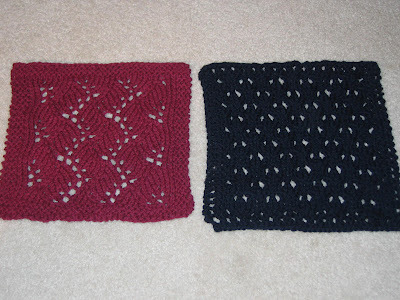 Donna sent two beautiful dishcloths. They're fantastic designs that are different from anything I've made. The burgundy one looks okay in the pic, but the navy one is just too dark to photograph well. That's too bad, because it's such a neat design with lots of texture and dimension. It's one thing to put together a swap package for someone when you know there's another swapper out there (hopefully!) assembling a goodie box for you, too. 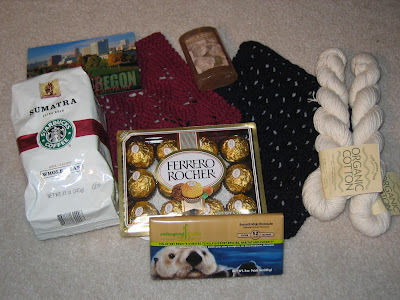 It's different when the swap is over, and you put together a box for someone knowing you won't get anything in return. 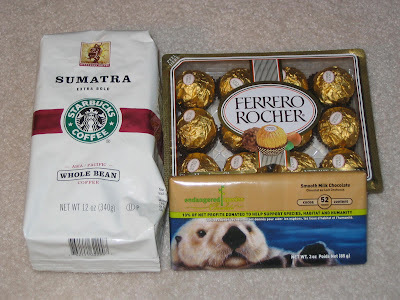 I received these gifts because Donna was willing to go above and beyond. A very kind gesture that meant a lot to me. will be enjoyed very much!! Oh, that is a great package! What a wonderful package! The dishcloths are very pretty. Congrats on the package!! Looks like a great one.